Summit County woke up to whiteout conditions on Monday morning as a winter storm swept through the area and is expected to continue into Tuesday. New snow accumulations through Tuesday morning are expected to range from 6 to 12 inches with local amounts up to 15 inches, according to the National Weather Service. The Hazardous Weather Outlook from the National Weather Service warns of gusty winds above timberline that will produce areas of blowing snow and reduced visibilities. West winds 25 to 35 mph will occur with gusts up to 60 mph above timberline. People traveling in the mountains should be prepared for winter travel and slick road conditions today and tonight. The Dillon Dam Road was closed all morning but reopened at 1 p.m. Loveland Pass remains closed due to adverse weather conditions. “Then a second and stronger wave should bring snow to I-70, the central and the southern mountains on Monday night through Tuesday morning with additional snow showers on Tuesday,” he writes. Tuesday morning is Gratz’s pick for best powder day. Powder Day! 4" of new snow. 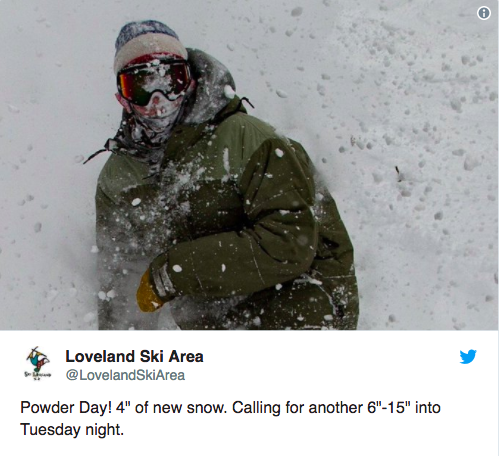 Calling for another 6"-15" into Tuesday night. Wednesday, Thursday and Friday are looking to be dry.